Time flies. It's Christmas again. Can't believe it's already 1.5 years since you've gone (for Nat, it's 4 years). How are our angels doing in Heaven? Through God's providence and intervention, Mummy and Daddy welcomed a new baby into our lives few months ago and we let her share Ashley's middle name 'Joy' so that she feels an affinity with her sister who's her guardian angel in Heaven. 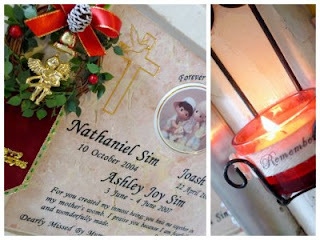 Mummy and Daddy specially bought some Christmas ornaments to decorate your niche to say we miss you especially during this season. The oppressive sadness which comes with missing you has now becomed a dull heartache that we've accepted as part of our everyday existence. God is gracious. He knows we'll never be able to pick ourselves up from the grief of losing 3 of you so He sent us a baby miraculously to bring us newfound joy and meaning in life. With her around, moments of hope have resurfaced and more importantly, we found ourselves being able to laugh again. However, Mummy and Daddy still hold each of you dearly in our hearts, some place safely tucked away where no one will ever be able to reach...we have not forgotten you and we never will do. So to welcome your baby sister, we put up the Christmas tree this year. If you were around to celebrate Christmas by our side , our family would be complete. God's mansion must surely have an even nicer and bigger Christmas tree as you'll be celebrating Jesus' Birthday! Please say a big Thank You to Jesus for sending Mummy and Daddy the perfect Christmas gift for 2008. Merry Christmas my darlings. We love and miss you always.